New Lower Price! 1GB DDR PC3200 400MHz (Non ECC) 64x64 CL3 2.6v 184 Pin DIMM for G5 Dual processor 2.0/2.3/2.5/2.7. Does not fit the Dual-Core or Quad G5's. Must be installed in pairs! Order 2! Lifetime Warranty. Some later models used the 4200 RAM check. 512MB PC2700 DDR 333MHz CL2.5 184 Pin Module for all Power Mac G4 Dual 867MHz - 1.42GHz Mirror Door "Porthole" Systems and "FW800" models, Apple Xserve G4 (all speeds), G5 1.6GHz, eMac 1.25/1.42GHz Systems, Mac mini 1.25GHz/1.42GHz Models. Our $29.77 price includes domestic shipping. 1GB PC2700 DDR 333MHz CAS 2.5 184 Pin Module for all Power Mac G4 Dual 867MHz - 1.42GHz Mirror Door "Porthole" Systems and "FW800" models, Apple Xserve G4 (all speeds), G5 1.6GHz, eMac 1.25/1.42GHz Systems, Mac mini 1.25GHz/1.42GHz Models. Our $49.77 price includes domestic shipping. Great upgrade for your PowerBook, iBook or iMac G4 System. Our $34.77 price includes domestic shipping. Great upgrade for your PowerBook, iBook or iMac G4 System. Our $59.77 price includes domestic shipping. 1.0GB (1024MB) Name Brand PC-5300 DDR2 667MHz SO-DIMM 200 Pin Memory Module for *ALL* Apple MacBook, MacBook Pro, iMac Intel, and Mac Mini Intel models. This Brand Name SODIMM features 1 gigabyte DDR2 memory, 667 MHz bus speeds and is PC2-5300 rated! For maximum power, add more Brand Name DDR2 memory to your MacBook or Mini!Our $24.77 price includes domestic shipping. 2.0GB (2048MB) Name Brand PC-5300 DDR2 667MHz SO-DIMM 200 Pin Memory Module for *ALL* Apple MacBook, MacBook Pro, iMac Intel, and Mac Mini Intel models. This Brand Name SODIMM features 1 gigabyte DDR2 memory, 667 MHz bus speeds and is PC2-5300 rated! For maximum power, add more Brand Name DDR2 memory to your MacBook or Mini!Our $28.77 price includes domestic shipping. 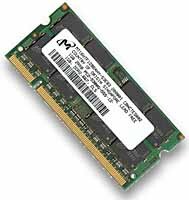 4.0GB (4096MB) Name Brand PC-5300 DDR2 667MHz SO-DIMM 200 Pin Memory Module for *ALL* Apple MacBook, MacBook Pro, iMac Intel, and Mac Mini Intel models. This Brand Name SODIMM features 1 gigabyte DDR2 memory, 667 MHz bus speeds and is PC2-5300 rated! For maximum power, add more Brand Name DDR2 memory to your MacBook or Mini. Our $84.77 price includes domestic shipping. 4.0GB Matched Pair (2GB modules x 2) PC4200 DDR2 533MHz 240 Pin DIMM for 'Late 2005' G5 PowerMac 'Dual-Core & Quad-Core' Models which have PCI-Express (Models with PCI-X require PC3200)Fits the Dual-Core or Quad G5's. Must be installed in pairs! Order this kit. 8 Non-Stacked TRUE PC4200 Devices per side. Data Rate = 533MHz. Meets and/or Exceeds Apple Specifications. Lifetime Warranty. Our $89.77 price includes domestic shipping. 2.0GB Matched Pair (1GB modules x 2) PC4200 DDR2 533MHz 240 Pin for 'Dual-Core' Power Mac G5 'Dual 2.0GHz', 'Dual 2.3GHz', 'Quad 2.5GHz - *These G5 models have PCI Express Slots - PC3200 required for PCI/PCI-X Slot model G5s*! New w/LifeTime Warranty. 2.0GB Matched Pair (1GB modules x 2) PC4200 DDR2 533MHz 240 Pin for 'Dual-Core' Power Mac G5 'Dual 2.0GHz', 'Dual 2.3GHz', 'Quad 2.5GHz - *These G5 models have PCI Express Slots - PC3200 required for PCI/PCI-X Slot model G5s*! Must be installed in pairs! Order this kit. 8 Non-Stacked TRUE PC4200 Devices per side. Data Rate = 533MHz. Meets and/or Exceeds Apple Specifications. Lifetime Warranty. Our $56.77 price includes domestic shipping. 2.0GB PC-6400 DDR2 800MHz SO-DIMM 200 Pin Memory Module for Apple iMac Intel (April 2008), MacBook (White) 2.13GHz (May 2009), PC Intel Core 2 Duos using PC6400 200pin. This Brand Name SODIMM features 2 gigabytes DDR2 memory, 800 MHz bus speeds and is PC2-6400 rated! Our $39.77 price includes domestic shipping. 4.0GB PC-6400 DDR2 800MHz SO-DIMM 200 Pin Memory Module for Apple iMac Intel (April 2008), MacBook (White) 2.13GHz (May 2009), PC Intel Core 2 Duos using PC6400 200pin. This Brand Name SODIMM features 4 gigabytes DDR2 memory, 800 MHz bus speeds and is PC2-6400 rated! Our $109.77 price includes domestic shipping. 2.0GB PC-8500 DDR3 1066MHz SO-DIMM 204 Pin Memory Module for Apple Systems. This Brand Name SODIMM DDR3 memory, 1066 MHz bus speeds and is PC3-8500 rated! Our $29 .77 price includes domestic shipping. 4.0GB PC-8500 DDR3 1066MHz SO-DIMM 204 Pin Memory Module for Apple Systems. This Brand Name SODIMM DDR3 memory, 1066 MHz bus speeds and is PC3-8500 rated! Our $49.77 price includes domestic shipping. 8.0GB PC-8500 DDR3 1066MHz SO-DIMM 204 Pin Memory Module for Apple Systems. This Brand Name SODIMM DDR3 memory, 1066 MHz bus speeds and is PC3-8500 rated! Our $72.77 price includes domestic shipping. 4.0GB DDR3 10600MHz SO-DIMM 204 Pin Memory Module for Apple Systems that use P10600 204pin for Apple Systems. This Brand Name SODIMM DDR3 memory, 10600 MHz bus speeds! Our $45.77 price includes domestic shipping. 8.0GB DDR3 10600MHz SO-DIMM 204 Pin Memory Module for Apple Systems that use P10600 204 pin for Apple Systems. This Brand Name SODIMM DDR3 memory, 10600 MHz bus speeds! Our $74.77 price includes domestic shipping.